IBM has a unique position in the marketplace, with cognitive platforms and services, industry-specific offerings and expert consulting to support electronics companies. 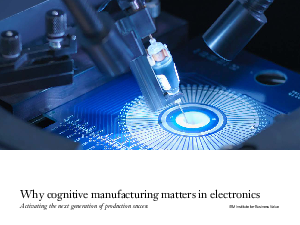 To understand how the electronics industry is applying cognitive computing to manufacturing, the IBM Institute for Business Value surveyed 140 electronics executives around the world and across all industry subsectors. We found that a core group of early adopters has kicked off a new generation of production success with cognitive manufacturing and show greater returns on investment (ROI) with increased productivity. Our analysis answers some important questions.